Jesuits and companions from Australia joined others from across the Asia-Pacific region to celebrate the first cohort of graduates from Colégio de Sto Inácio de Loiola (CSIL) in Kasait in Timor Leste on 22 December. 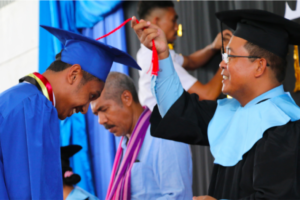 Colégio de Santo Inácio de Loiola (CSIL), the Jesuit secondary school in Timor-Leste, celebrated a historic event with the graduation of its pioneering class of students on December 22. The ceremony started with a thanksgiving Mass presided by Timor-Leste Regional Superior Fr Joaquim Sarmento SJ to give thanks to God for the grace and spirit of accompaniment from the day the students started at CSIL until their graduation, and also to the teachers, staff, parents, superiors and everyone who contributed to the success of the students today and in the future. Jesuits from all over Asia Pacific were present at the event, including Fr Mark Raper SJ, who was responsible for first launching the education project. Among the other Australian attendees were Australian Provincial Fr Brian McCoy SJ, and Jesuit Mission Director Helen Forde. The school has strong ties to the Australian Jesuit community. Jesuit and Companion schools participated in fundraising efforts, and students from the schools also travelled to Timor Leste on immersion. The graduating class chose for their theme St Ignatius of Loyola’s famous line, ‘Go forth and set the world on fire’. It was a momentous occasion for the 103 graduates who had worked so hard to realise their academic goals. Among the graduates were 61 students who had first enrolled at the school in August 2012, when there wasn’t even a single building on the site – the others had joined after junior high. The first graduation was made even more special because of the outstanding performance of the students in the national examinations. All of the students achieved passing grades, and to the surprise of many, Loyola occupied top three places in the examinations, both for the natural sciences and technology track and the social sciences and humanities track. The class valedictorian, Salvador Jubileano Leano Zota Soares, achieved the highest grade in the national exams. He is finalising details for a scholarship in South Korea. He said the results were not just his own dream, but one he shares with his parents and the school. ‘My parents have been very supportive of what I have been doing and the school has given me everything that I need to accomplish my dream. The school wants its students to be the best and my family also wants me to be the best. So now that I have achieved the best, I feel proud to be the best in both worlds’, said Soares. Two other students from the school – Melissa da Costa, who took second place in the national exams, and Geovania Garret Mouzinho Freitas, who took third place – are incoming scholars of Sophia University, the Jesuit university in Tokyo. They will move to Japan in April 2019. Geovania was also a recipient of the Loiola Award, which is given out to one male and one female graduate at the school who not only perform well academically, but also live out the ‘4 Cs’ of Jesuit education – competence, conscience, compassion and commitment. ‘I hope that in the future I will make more successful steps forward to be able to serve others and to be what I can for the greater glory of God’, said Geovania. School principal Fr Roberto Boholst noted that while academic success is good, it’s the character of the graduates that is most important. 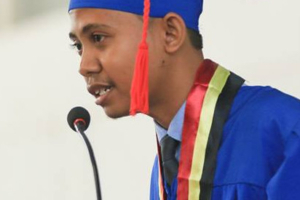 ‘While we celebrate the academic success, we constantly remind ourselves that the Jesuit Education Project is not just about continuing a tradition of excellence; it is our commitment to the people of Timor-Leste in their efforts towards nation-building’, he said. Jesuit Mission Australia has supported Colégio de Sto Inácio de Loiola from its inception, accompanying the students on their learning journey over the past six years. This video features some of the people involved in the project, as well as interviews with some of the students themselves.